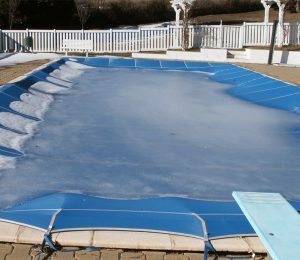 With the colder months coming up, many northern states close or “winterize” their pools. This includes draining the pool, emptying the pipes, and covering/sealing the top to prevent the water from freezing and damaging any plumbing or the surface of the pool. However, in Florida, there is no need for such action. In fact, there are dangers to draining your pool with the amount of ground water we have in this state. Generally, in Florida, swimming pools are used year round because the water never freezes and most commercial pools are equipped with a heater. Because it never gets quite cold enough to discourage algae growth, if you drain your pool half-way, drain the pipes, and turn off your pump, the pool will more than likely turn green. So as long as you keep your water balanced and your pump running, here in Florida, you are set for the winter! Why is it dangerous to drain my pool? Your pool shell is like a boat, and it will, given the right circumstances, “float” on the ground water in your yard – “popping” it out of the earth and causing significant damage in the process. This is mainly a Florida phenomenon and is called “pool popping” in the industry and you should make sure your pool resurfacing company has adequate insurance that specifically covers this peril in Florida. Advanced Pool & Spa clients can rest assured that we are covered for these circumstances and follow a strict operating procedure to prevent it from happening in the first place. What is the right circumstance for this to happen? Good question- the right circumstance or really the wrong circumstance is that the water level in the pool is below that of the surrounding ground water enough for the hydrostatic pressure of the ground water to overcome the weight of the pool and the water your pool contains. So think of your pool’s water as ballast on a boat making it ride low in the ground water of your back yard. If you have standing water in your yard for days, that’s the level of the ground water. If you drain your pool too much, you could be creating a dangerous situation. In closing, it is not necessary to “winterize” your pool this winter here in Florida. So, if you’d like a cool dip in the water or you have a heater, happy swimming!